In the past four decades, UAB researchers have discovered the origins of AIDS, found cool new ways to make metal, and hauled up a potential cancer-fighting drug from the Antarctic sea floor. Learn more about how UAB research has changed the world in the stories below. When UAB was searching for a mascot in the 1970s, a popular suggestion was “the Cranes.” Not the birds, but the metal monsters seen towering over campus as UAB expanded from a handful of blocks to dozens. UAB researchers have communicated a number of up-close-and-personal discoveries that have greatly expanded our understanding of the body’s defense system. UAB Egyptologist Sarah Parcak, Ph.D., is like Indiana Jones—in space. A pioneer in the use of satellite imagery for archaeology, she uses images from NASA and other sources to find ancient sites buried beneath desert sands. UAB’s polar team has spent decades at the bottom of the ocean on the bottom of the world, investigating the weird and wonderful macroalgal and invertebrate populations that live on the Antarctic sea floor. 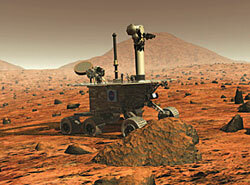 When NASA launched two robot explorers to Mars to seek out signs of water—and life—UAB astrophysicist Thomas Wdowiak, Ph.D., was in charge of one of the most crucial elements of the mission. 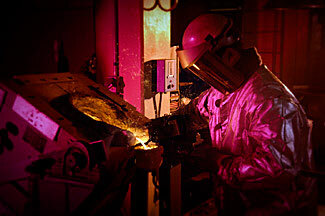 A century after molten iron began flowing from Birmingham, UAB has earned an international reputation for advancing metals-casting technology and developing stronger, lighter, and more economical materials. Over three decades, UAB psychologist Karlene Ball, Ph.D. has developed a set of relatively simple exercises that help keep older drivers on the road longer. Since the gene responsible for cystic fibrosis was identified in 1989, scientists have been searching for a way to correct the mutation that causes this devastating disease. UAB researchers have found two. Ten years ago, an M.D./Ph.D. student at UAB made a vital discovery that allowed scientists at UAB's Gene Therapy Center to devise new molecular weapons for the war against cancer and other diseases. First Richard Whitley, M.D., and colleagues at UAB helped treat the symptoms of herpex simplex virus infection. Then they turned the dangerous virus into a vital part of the physician's toolkit. UAB AIDS researchers and clinicians have been on the front lines of the global fight against the disease since the early 1980s. Tim Townes and fellow UAB researchers were the first to produce a viable animal model of sickle cell disease; recently, they made another breakthrough, using a revolutionary new stem-cell technique to cure sickle cell disease in mice. When Alabama governor Lurleen Wallace was diagnosed with cancer in the late 1960s, she had to travel outside the state for care. Today, UAB's Comprehensive Cancer Center attracts patients from around the world and contributes research breakthroughs that change the lives of patients everywhere. The flexible fiber-optic endoscope designed by Basil Hirshowitz changed the way doctors examine their patients. Neuroscientist Edward Taub invented a revolutionary therapy that helps the brain recover from stroke. UAB built the first public, university-affiliated diabetes hospital in the country in 1973 and has been at the forefront of diabetes research and innovations in clinical care. A pioneering study led by UAB researchers is rewriting the facts about stroke in the South. Larry DeLucas was the first optometrist in space--and his zero-gravity protein research was an important step in the development of innovative new drugs to treat AIDS and other diseases.